When a 30 car train hits a car, the vehicles hit each other with the same amount of force as a car smashing an aluminum can. It is that type of force that leads to more than 2000 accidents with many injuries and deaths at railroad crossings around the country each year. Ninety of those were in Alabama in 2015, according to Alabama Operation Lifesaver. Alabama has 6000 railroad crossings and 3500 miles of tracks. This means that drivers and pedestrians encounter railroad crossings every day. Operation Lifesaver Alabama travels the state regularly on a 40 city tour to educate citizens about the importance of railroad safety for drivers and pedestrians. Operation Lifesaver says that it has helped to cut down car/train accidents across the US from 12,000 in 1972 to 2059 in 2015. Even though the number of accidents has declined, Alabama still ranks #6 in the US for the number of accidents each year. While Operation Lifesaver says it is very important for drivers and pedestrians to pay attention and to stop at railroad tracks, it also is important for railroads to make sure the safety lights and gates at crossings are working, and that the grass, trees and brush are cut so that drivers can see oncoming trains. Railroad crossing accidents can lead to serious injury or death. If you or a loved one was in such a railroad accident, we want you to have as much information as possible. There are many federal and state rules that affect the duties and responsibilities of the railroad company and crew that are using that railroad crossing. Some of the accidents that occur at railroad crossings are due to train engineer or railroad company error. One area where a train engineer can cause an accident is speeding through a railroad crossing; federal rules limit how fast trains can go through railroad crossings. Also, federal regulations apply regarding when a horn or whistle must be blasted at a crossing. Further, trees, shrubs and vegetation at a railroad crossing must be trimmed so that drivers have an unobstructed view. 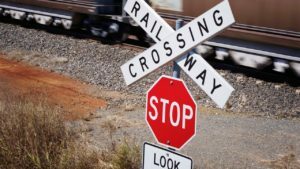 In short, railroad crossing accidents are very complex legally, and anyone in such an accident should speak to an experienced railroad accident attorney. Large settlements are possible in many railroad crossing accidents. The engineer running a New Jersey Transit train that slammed into Hoboken Terminal in September had a undiagnosed sleep disorder, according to his attorney this week. The engineer, Thomas Gallagher, recently discovered that he had severe sleep apnea. The test results that confirmed the disorder were sent to federal authorities on Oct. 31. Gallagher stated that he did not remember the crash at all, and he believes that the sleep disorder may have led to the accident that killed one and injured more than 100. His attorney stated that the engineer believes that the sleep disorder caused him to black out just before the crash. Gallagher said that he remembered checking his speed as he should just before pulling into the terminal, blowing the whistle and ringing the bell. The next thing he remembered, he was on the floor of the engine after the accident. The train smashed into the station in the middle of a busy morning commute. The person who died was on the train platform and was struck by debris. Other commuters also were injured by flying debris, and some passengers on the train also were injured. Undiagnosed sleep apnea can be a serious danger for professionals who operate trains, trucks, airplanes or other commercial transportation. The condition involves pauses in breathing during sleep, which causes the person to wake up. This can lead to excessive sleepiness during the day. The Federal Railroad Administration or FRA stated this week that it would release a new safety advisory to urge railroads to more aggressively fight worker fatigue and to install cameras in trains. 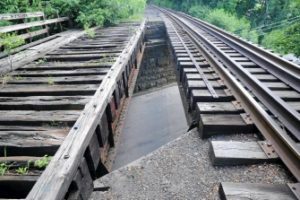 As railroad accident attorneys in Virginia, we wish that the train engineer had been diagnosed with his sleep apnea condition as it could have saved lives. Also, this tragic train accident is another reminder of the importance of commuter trains installing Positive Train Control or PTC. This system would automatically stop a train before it is able to speed excessively or to run a red signal. PTC was supposed to be installed on at least 25 US passenger train systems by the end of 2015, but it has now been delayed until 2018. We hope that PTC will be installed on major commuter rail systems as soon as possible so that serious train accidents and derailments can be prevented. Our railroad attorneys have worked on major train accident cases involving large financial settlements and verdicts, and we would like to see fewer of these tragedies happen.